Granola is one food we eat in massive quantities. 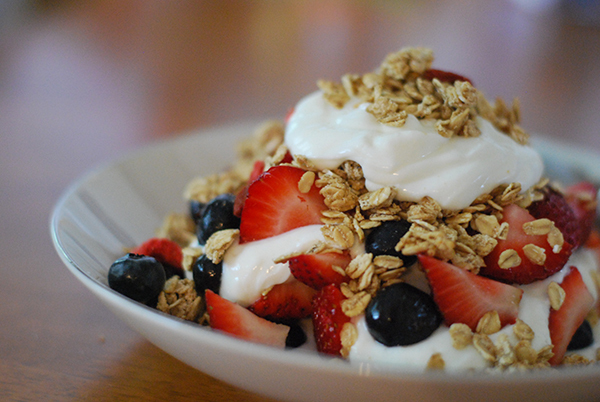 One of my favorite breakfasts of all time is a big bowl of granola with yogurt and berries. I knew one day I would tackle making granola without all the honey and maple syrup in it – because let’s face something here…I like a challenge. 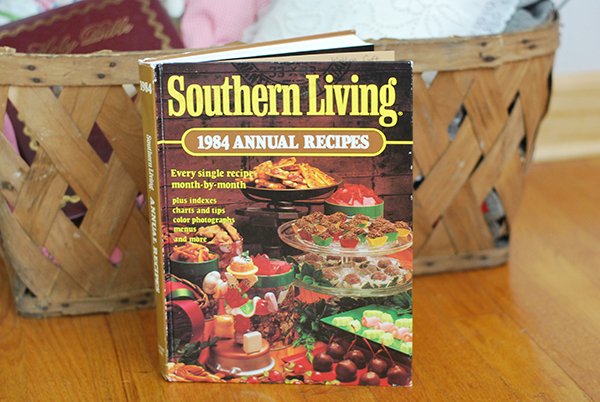 We’re in another one of my 11 Southern Living Cookbooks – 1984 (in case the FTC is reading this, that’s an affiliate link –but I doubt they’re reading since this is a blog about being smart with money). In 1984, I was 3. I have been told I was an angel when I was 3. Actually, that’s a lie. I was not an angel. My Mama says I talked all the time and my Daddy says I’d argue with a fencepost. Now that I’m thinking on it…I still have both of those qualities. I get really great ideas looking through these cookbooks – a lot of the recipes in them give me an idea that I run with and then create my own recipe…kinda like this granola that I tweaked. If you see these at yard sales, pick them up – they’re great fun. This recipe is called Crunchy Granola. It originally called for brown sugar, raisins and vegetable oil…all things we don’t eat here. But I knew with some tweaking I could create another great granola recipe. I replaced the brown sugar with stevia…and I nixed the nuts and wheat germ. I added egg whites + water as a binder instead of using sugar or maple syrup. It worked very well and I think I’ll continue using that method. It was like a EUREKA moment for me. I get those a lot…but I’m usually in the bathroom. Don’t ask. I added unsweetened goji berries (you could also use dried cranberries) and freeze-dried strawberries in place of the raisins and nuts. I love it! Annie hates it…she just wants her granola plain. I learned my lesson when spending about 10 minutes picking out the berries from her mixed up parfait. To add a coconut flavor to this, I used some coconut flour and coconut extract. You could leave those out if you like…not really. Don’t do that. 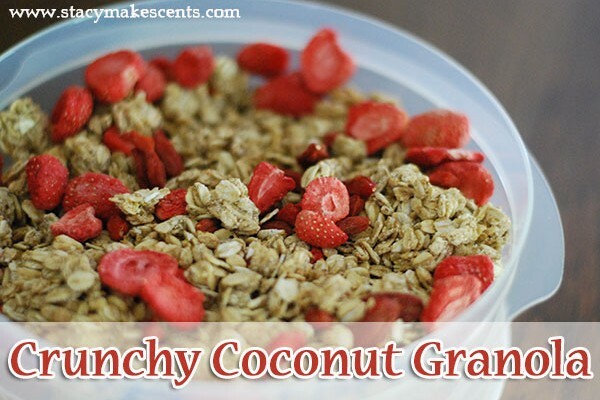 Then this wouldn’t be Crunchy Coconut Granola. Duh. Don’t mess it up for me. Does this taste like “regular” granola? No. It’s drier and not as glazed over like you get with syrup and honey. But man…we like it. Mixed up with some Greek yogurt and berries, this is a total win. I want more right now. Annie was eating it off the pan before it cooled and Barry keeps sneaking bites when I’m not looking. I need to hide it. I’m thinking the closet is a good plan. Combine oats, coconut flour, stevia, and salt in a mixing bowl. Combine water, egg whites, vanilla and coconut extract in a small bowl. Pour liquid over oat mixture and toss to coat. Spread out on a lightly greased baking sheet. 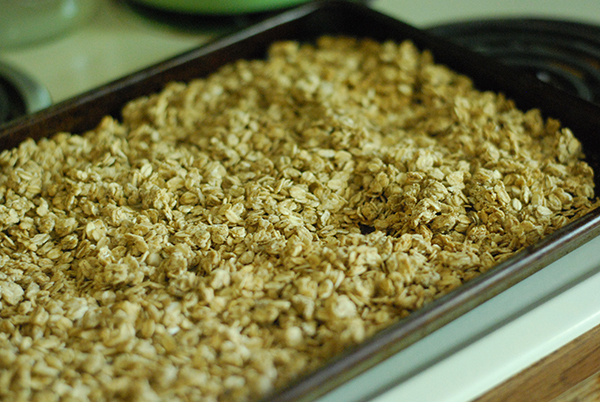 Bake at 300 degrees for 45 minutes to 1 hour, stirring every 15 minutes…until granola is browned. I am so glad to have found this recipe! I’ll be traveling with my daughter’s marching band this weekend on an overnight trip and I made this to bring with me! I also made an “S” granola – so I’ll be covered on all bases!! And I really don’t care for plain yogurt (or yogurt of any kind) so I’m hoping this will be that “bump” i need to get more protein in! Thanks so much! Thanks for commenting! So glad to hear Stacy’s Granola helped you out! It’s such a perfect recipe for make-ahead breakfasts, especially when you’re traveling! Where can you buy freeze dried fruit? Vitacost has it. I believe Tropical Traditions has it as well. You are a genius! This stuff is great (I’m eating some right now)! Love this recipe but wanted something with a peanut butter flavor instead of coconut. I still use oats, egg whites, stevia extract, water, salt — but instead of the other ingredients I add 1 Tbsp. Butter, 2.5 Tbsp. no-sugar, natural peanut butter, 1/4 cup defatted peanut flour, and a dash of vanilla. I prefer to melt the butter and peanut butter, mix them with the other wet ingredients and then pour over/mix in with oat/peanut flour. My calculations put the fat grams at 39 for the entire batch. (8) half-cup servings makes each serving less than 5 grams. I like to eat with fruit and a protein smoothie on the side, or a parfait of fruit with sweetened Greek yogurt. Thanks for the original recipe! Glad you were able to adapt it to your needs! Quick question, do you think that protein powder could be substituted for the coconut flour? I’d hate to mess with your recipe, but my girls are allergic to coconut and they like to steal my granola! I’m not sure – coconut flour is super absorbent and protein powder is not. But I’d say it’s worth a shot! Wow! Stacy, you always come thru for me. I miss granola sooooooo much. My daughter made some to take back to college the last weekend she was home, and I truly wanted to cry. I have intended to tweak the recipe I usually use, so that I can once again eat granola. thanks for saving me the time. I cannot wait to make this, and plan to do so today! Easy to make, easy to eat. YUM!! Thanks for this great recipe. Wow! So simple! I need to try making homemade granola! Thanks for linking up to Sweet & Savory Saturdays #23. Love Love granola!! Thanks for sharing at Gluten Free Fridays! Stacy, thank you so much for this. 2 of my kids were diagnosed with celiac last winter, and we have struggled with breakfast cereal options that taste good to them and are filling. My son, a very limited eater due to the trauma of undiagnosed celiac, LOVED this. He doesn’t like nuts and it never occurred to me that granola would be good without them! Since I am trying to add calories for him, I used coconut oil instead of the egg whites, and included the shredded coconut. But the basic idea came from you, and he loves it! Not my daughter, but it is too much to ask that my two celiac kids enjoy the same recipes. 🙂 My second batch is in the oven right now. I recently made granola and cringed a little when I looked up (belatedly) the calorie count–something we don’t need in excess in our family. Next time, I’ll use your wonderful recipe. Have a great weekend! Sounds like delicious granola! Thanks! I am fascinated by your granola recipe! I guess I will have to make it and see how I like it. Thanks for sharing this healthy recipe! I’m so glad you liked the zucchini enchiladas! Thank you for featuring it!! 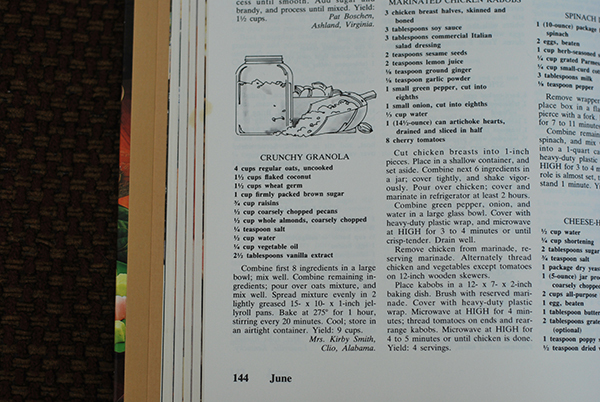 Looks like a great recipe for THM E granola! (Could’ve used some this morning!). Where do you get your freeze dried strawberries? I am part of a co-op but I looked and they don’t carry them. I think they have them at my Target but they may be cheaper online? They are quite pricey – I buy mine from Tropical Traditions ($6) or Vitacost…just depends. I use them sparingly. I think they are sold at Trader Joes too. 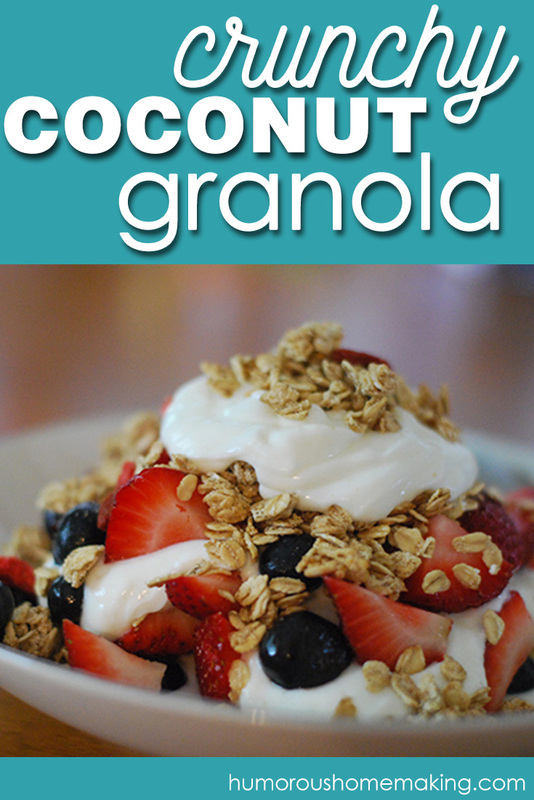 Oh, I love granola, and need to try this one! Today I just crumbled up baked oatmeal in a pan, toasted it a bit, and poured almond milk over it – very satisfying, but I’d love to have a granola made up that is quick and easy! Oh baked oatmeal, how I love thee! Yum! Can’t wait to make this granola! Stacy, I love you! Just sayin! I have been craving me some granola for a week, but had no idea how to make it on plan! thank you thank you! You’re most welcome! I’m always craving granola. Your granola looks like a great way to get an E meal in! I added my Morning Sunshine Creamsicle Smoothie. If made by the recipe it’s FP, but of course I forgot to add that. Thanks for another link up! I’m always on the lookout for good Es! This looks so good! I struggle with e meals so I can’t wait to try this! I think everyone does – I’m trying to put out a lot of those for y’all. 🙂 Well, girl…you’re tooting my horn. THANK YOU SO MUCH!! I butchered a batch of trial granola …. we are trying to go “cold cereal” free here-or, at least, *I* am. lol…. but my kids love it for breakfast-and my hubby is starting to miss it as a nightly snack, but I just CANNOT buy it any more…. and even though milk is off plan for me-we only buy whole for the kiddos, I think my kids might like this with milk! I’ll see if I can get hubby to eat it with yogurt…. here’s to wishing. lol…. but at least it wont be sugar and chemical laden! Thanks again! Hi Stacy! I am new to your site, and have been loving your articles and your personality. I hope I didn’t miss this in your post, but I was wondering if you would mind giving me a THM serving size for your granola? Thank you! Ya know, it was in my head but not on the recipe. LOL Not any help, was I? I added it. 1/2 cup. I can’t wait to try this…my kids love granola. Thanks for hosting. I love granola too – smart kids. A lot gluten free granola is looser like that and not as crunchy. I have gotten used to it and love it, but my husband isn’t convinced yet. This looks yummy, I love coconut flour, it’s so great to make recipes with! Brilliant idea to use egg whites! I thought granola would be out of my house for awhile but I guess not! Egg whites for the win!